Today's Natalie Morales recounted how the President, after being spotted by the Kiss Cam, at first refused to kiss Mrs. Obama. Morales hyped, "...They got a second chance when the "Kiss Cam" found them again. So this time he delivered, planting a very presidential pucker on the First Lady and the crowd went wild." Weatherman Al Roker joked, "Mr. President, get a stadium." CBS anchor Gayle King lauded the second chance, praising, "Yes! I love when they get clapping." This isn't the first time the network morning shows have rhapsodized over high profile Democrat couples. In 2007, the hosts of GMA cooed over John Edwards and Elizabeth Edwards (the former would later cheat on and divorce the latter) renewing their wedding vows at Wendy's. In 2004, then-Today anchor Katie Couric touted the idea of two millionares spending their anniversary at a fast food restaurant. Couric enthused, "What do you say, ‘One Frosty, two straws?" For more on Monday's kiss, see a blog by the MRC's Kyle Drennen. JOSH ELLIOTT: And finally, we all know the President loves to play basketball. But he is showing the world he's got a little game off the court as well. Take a look. The first family taking in a Team USA basketball game last night when the kiss cam zooms in. President Obama fouls out, choosing to forgo a public display and thus drawing boos from the crowd. But, the kiss cam gave him a second chance. And wouldn't you know it? The President puckered up. Ahh, young nationally-televised love. Ain't it grand? ROBIN ROBERTS: Look at Malia. ELLIOT: Malia's like, "get me out of here. This is so embarrassing. Would you guys stop that? You're on camera." Yeah, it's great stuff. 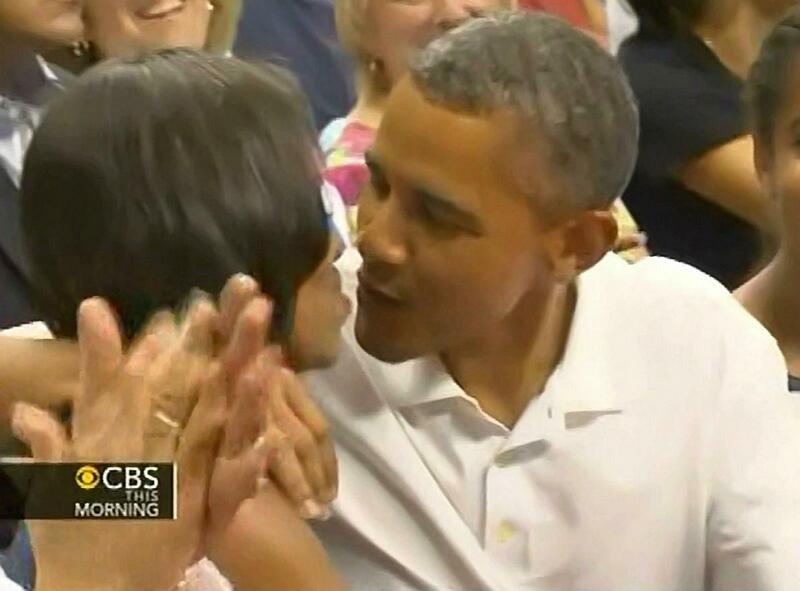 NORAH O'DONNELL (voice-over): Well, even the President can't say no to the 'kiss cam.' President Obama and the First Lady were watching the men's Olympic basketball team play an exhibition in Washington yesterday. Whoo-hoo-hoo! Hot in here! (Charlie Rose laughs) And the arena's 'kiss cam' spotted them, but the first couple wouldn't bite. Well, that generated some boos. And then, later in the game - you just saw it - a second chance, and this time, the President delivered. Look at his daughter, even laughing. GAYLE KING: Yes! I love when they get clapping. O'DONNELL: Yeah - roared with approval. KING: It seems like even the President and the First Lady bowed to peer pressure there, because there is a lot of pressure when it comes on you. O'DONNELL: Yeah. It wasn't quite the Al Gore and Tipper Gore kiss, though. CHARLIE ROSE: Didn't last that long. O'DONNELL: It didn't last that long.